That fall (1914 or 1916) Eugene and a dozen other youngsters from the Omaha and Winnebago reservations left the train station at Sioux City and headed nervously to the Indian school at Pipestone, Minnesota. Once the children arrived in the early afternoon, the first step was indoctrination and registration in the small office of JB Davis, school disciplinarian—a big man with a rough face and cold, dark eyes. 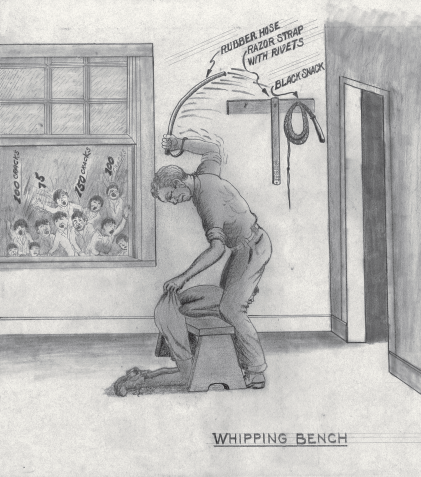 After a brief speech about strict discipline, JB pointed to a small whipping bench in the corner and a variety of whips hanging on the wall—wide straps with rivets at one end, rubber hoses, a cat-o-nine-tails, and several bull whips. Early Pipestone pictures, from top: train station (1920), dining hall before dinner (1910), school campus (1910s); quarry where Native Americans did most of the heavy lifting (1908). (postcard collection courtesy of LakesnWoods.com). As he climbed into bed that night, Eugene was uneasy. There was a pervading tension in the room, and it was eerily quiet for a roomful of kids. It was dark, everyone was in bed, and there wasn’t a sound. Suddenly the still, night air was shattered by a loud crack coming from JB’s office followed by a shrill scream. Eugene cringed. Another crack . Another scream. Another, and another. With each blood-curdling duet, Eugene crawled deeper and deeper under the sheets and covered his head. When the noise ended, Eugene’s body remained tense. He waited… and waited… and eventually fell into a troubled sleep. The next morning over breakfast one of the students told him it was routine. When a student ran away from school, bulletins went out to all the surrounding farms. Anyone lucky enough to capture the runaway would receive a $3 bounty. This time the student had been caught in early afternoon and taken to JB’s office for a lecture. That evening at bedtime—always at bedtime so everyone could hear—he’d been called back to the offices, his clothes stripped off, and a wet sheet wrapped around him so that the whip wouldn’t cut into his back. Then JB whipped the boy until he passed out. After the whipping, the boy was taken to the school clinic, where he’d probably recover within a week. Some students weren’t so lucky. Several funerals were held at the school cemetery each year, some as a result of whipping, others from food poisoning or illness. Parents sometimes didn’t hear about the death of their child for as long as five years, since many students were sent to Pipestone for the duration of their grade school education. Eventually Eugene adjusted to the Pipestone way of life: student gangs, perpetual hunger, stiff corduroy uniforms, itchy union-suit underwear, brass-toed shoes, and platoon formations of students marching everywhere but to the outhouse. Students had organized into tribal gangs—Lakota, Oneida, Chippewa, Pottawatomie, Arickaree, Sac and Fox, and others. Eugene was Lakota but fell in with the Omaha-Winnebago gang, since he’d come to the school with them. They were the smallest gang. The biggest gang was the Chippewa, since their reservation was nearby. The leader of Eugene’s gang was Charlie Grayhair, the oldest of the group. Charlie’s favorite pastime was constructing miniature wooden models of new creations, like a ship with pulleys and strings for rescuing submarines and recovering sunken ships. In the winter months he showed his gang how to fashion red granite from the Pipestone quarry into various novelties, including letter openers and paperweights in the shape of bibles and crosses. The Pipestone area was famous for its blood-red granite. The knee-length pants warn by students were perpetually tinted red from the dust that covered the ground for miles around. Charlie was the only member of their gang old enough to go to town every other Saturday for Boys’ Day. On the big day, the gang members loaded all of their handicrafts into a bag that Charlie carried to town. It was an unwritten contract that he’d sell the novelties, watch the matinee at the local theater, then buy a bag of donuts on his way back to the school. And he had to watch the matinee twice in order to memorize everything. He had a good memory and was a great storyteller, so as soon as he got back to school, his gang snuck away to an empty room and barred the door so they wouldn’t be bothered by other gangs. They sat in bliss, eating donuts and watching Charlie go through the entire movie, acting out each scene and making up the dialog for the silent picture as he went along. He held the gang spellbound. Eugene admired the honesty and imagination of his gang leader-philosopher-teacher, but Charlie didn’t know how to fight, and fighting was an integral part of Pipestone culture. One day the big Chippewa gang stole a ten-inch-square bacon slab from the commissary and smuggled it to the quarry, where every gang had its own cache hidden among the rocks and boulders. Meanwhile, Charlie’s small gang was parching corn at their hiding place nearby. When they heard the commotion of the Chippewas, Eugene scrambled through the rocks toward the noise to investigate. As he pulled himself slowly to the top of a large boulder and peeked over, he saw the Chippewas glorying in their prize. He watched as they stashed it carefully under a rock. Eugene hurried back to his gang and reported the bacon slab. Mouths began to water as the boys climbed to their feet and moved stealthily toward the Chippewa cache. As the Chippewa gang paraded jubilantly back toward school, Charlie’s gang moved in, and Eugene grabbed the bacon. A small hole had been bored through one corner of the slab and a tough, fibrous cord shoved through so it could be easily carried or hung. Eugene handed the prize to Charlie, who wrapped the cord around his wrist, and the gang retreated to their own cache in silent victory. Meanwhile the Chippewas had sensed trouble and doubled back. They reached the scene in time to catch the small Omaha-Winnebago gang red-handed. As they swarmed down through the boulders, Charlie’s gang scattered. They were outnumbered about three to one. During his escape, Eugene glanced back and saw them catch Charlie Grayhair, who was being slugged and shoved around in the middle of the fray. One Chippewa boy yanked the slab of meat from Charlie, grabbed it by the cord, and began beating Charlie senseless. Eugene quickly regrouped for a counterattack. His small gang stormed through the boulders, whooping and throwing rocks at the Chippewas. Before the two armies could clash, the Chippewas fled with their bacon slab. Despite the contention among gangs, all students had something in common: they were always hungry. There just wasn’t enough good food to go around, so everything was laid out in front of the students on long tables, and when the third bell was rung, the meal was up for grabs. Younger students like Eugene were usually out of luck. Supposedly they could raise their hands and a young waitress would bring around refills, but in reality all the waitresses had boyfriends in the higher grades who took up all their attention. The main objective of gangs and individuals alike was to find food. They stole what they could from the slop wagons that hauled the food, they robbed the school garden for vegetables, and the fortunate students killed chickens to be smuggled to the boiler room and cooked. When Eugene was put on the boiler room detail to learn how to maintain and overhaul the boilers, farm boys would occasionally sneak in during his night shifts with two or three chickens, and they’d feast. One evening a wagonload of food came in and some of the school’s staff began unloading crates of dried meat, dried vegetables, fruit and bread. Eugene and several friends were nearby. Their mouths began to water as the men carried crate after crate of food into the commissary. While the workers had their backs turned, Eugene and his friends crept inside and found hiding places at the rear of the store. Before long the job was finished and the men locked the door for the night, locking the boys inside. They gorged themselves for an hour on hard tack, dried fruit and dried meat, then realized there was no water in the building. They began to feel bloated and miserable. They tried to force the door, but it was sturdy and locked from the outside. Later that evening a watchman touring the school grounds heard groans and whining coming from inside the commissary. He unlocked the door and shook his head as the students filed out clasping their stomachs and groaning. Eugene’s sketch (1977) of how he remembered that day 60 years earlier. Eugene knew it wasn’t personal. Most of the other kids didn’t even know him. Nearly everyone had felt the bite of JB’s whips, and many of the boys’ backs were heavily calloused. Some boys gave an eerie laugh every time the whip cracked on their backs, which infuriated JB, who increased the intensity and duration of the sessions. It was just part of the sadistic, mob culture that had become a way of life at Pipestone. A familiar grin crept onto JB’s face as he turned toward Eugene, walked over, straddled the boy’s head, and gave him a hundred lashes. Pipestone youngsters got military-type training—drilling in companies and marching everywhere except to the privy. A week before Christmas, Eugene was marching to the dining hall when he noticed a well-dressed woman standing on the dining room steps and watching his platoon approach in formation. The closer Eugene got, the more she looked like his mother. When Eugene was within a block of the dining hall he realized that was really his mother Laura. He broke ranks and virtually flew to her, then screeched to a halt and gaped when he sensed her hesitation. “Who are you?” she asked Eugene. Laura didn’t recognize him for a moment. His oversized corduroy coat was fastened in the back with a rusty nail, and the lining was stiff from the syrup sandwiches Eugene smuggled regularly from the mess hall. The clumsy shoes weren’t the same size. The heavy, flannel, union-suit underwear was so small that the shirt section couldn’t be buttoned. His chapped skin looked like alligator hide. It was a common practice of Pipestone students to urinate on their hands to relieve the pain of dry skin. When Eugene walked he looked like a big bell, his little legs churning inside the stiff, corduroy coat as it swayed back and forth. Laura was shocked and choked back tears when she realized it was Eugene. She was invited to eat in the employees’ table in a private room off to the side but insisted she’d eat with her son. She had to see what kind of food he was being fed. Eugene escorted his mother into the dining hall, someone brought her a chair, and they sat down among the other kids in Eugene’s company. When the third bell was rung, Eugene tried to grab enough food for both of them, but he was too slow. Throughout the meal he raised his hand to get the attention of the waitresses, but as usual they ignored him, even with the presence of an adult at the table. She noticed the tableware—enamel-coated cups, dishes, platters and bowls covered with chips and rust spots. She noticed the meal—the same meal the students were fed everyday: thick, brown gravy, bread and syrup. On rare occasions the students would get mashed potatoes or small slices of meat, but it was always covered with the thick, tasteless gravy. When Laura took her son to town he told her everything about Pipestone life. She listened in stunned silence. When she returned home she told her husband Levi about the deplorable conditions at Pipestone, and they rushed off a letter to Washington. As an agent at the reservation, he thought it might get some attention. Meanwhile, Christmas Eve came to Pipestone, and the students gathered in the chapel auditorium to enjoy the annual holiday program. Things didn’t go well for Eugene. In one skit he came onto the stage twirling a new pair of roller skates in a circle above his head while reciting a Christmas verse. The skates weren’t his but he wished they were. Maybe the teacher will let me keep them after the skit, he thought…. He was so preoccupied that he lost track of the verse he was reciting. He glanced nervously toward his teacher the wings. She was gesturing wildly to spark his memory, but to no avail. As Eugene glanced back and forth between the frantic teacher and the puzzled kids in the audience, the twirling skates began to slow down and descend… until they smacked him on the side of the head. As the audience roared with laughter, Eugene walked slowly off the stage crying. The teacher met him in the wings, took the skates, and sent him out to the audience to take a seat. After the program the staff passed out presents that had been sent from home. Whenever someone walked his way with a gift his eyes lit up, but disappointment followed disappointment as the gifts were all handed to someone else. When only one big box was left, Eugene began to cry. A teacher tapped him on the shoulder and told him to follow her. He expected to be punished for fussing, but instead was led to the last gift, a large wooden crate resting on a shiny, new sled. Eugene’s face lit up as he asked permission to have a friend help move the gifts. She nodded consent. Charlie Grayhair was standing a few feet away ready to help out. He’d spent the past half hour watching over Eugene in silent sympathy. He’d already made arrangements for the rest of the evening. The gang was waiting in a secret room by the time Charlie and Eugene brought in the box and sled. Laura had packed the box with candy, cookies, fruits, cold cuts, and a variety of clothes. The gang feasted late into the night that Christmas Eve. Soon the school felt reverberations from Laura’s visit. Prompted by her letter, the Indian Bureau in Washington sent several officials to the school for a surprise inspection. The food quickly improved, and the rusty dinnerware was replaced with heavy crockery. When the staff learned that Eugene’s parents had initiated the investigation, Eugene was called to the office and promoted to head office boy and tour guide, the most sought-after student jobs at Pipestone. Soon he was running errands for the staff, showing tourists and visitors through the school, getting big tips from the guests, and eating one meal a day in the staff dining room. He was also allowed to wear his own clothes instead of the itchy, ill-fitting Pipestone uniforms. Teachers began to treat Eugene with more respect… and to say nice things to him… and to often ask if his mother was planning to visit again anytime soon. Again, sources vary about some details of Gene’s experience at Pipestone. Alisa Zahler at the History Colorado Museum found evidence that after Laura’s initial visit to the school, she was prohibited from ever visiting again. I suspect Alisa did more scholarly research into some details of Eugene’s life than I did, so if you (the reader) encounter conflicting details, you might lean more toward her account. My articles are intended mostly to share the flavor of Eugene’s life in rich detail based on my old notes and backed by cursory research done on the Internet. Also to fit Eugene’s story into the bigger picture of “noble savage” life as explored on this website. Eugene awoke one cold morning in 1918, burst from his bed, and dashed to the outhouse to throw up. Stumbling weakly back to bed he heard moans and groans from many of the beds in the dorm. His first thought was food poisoning, but word spread quickly that day that the entire country was being swept by a flu epidemic. Within two days, more than half of the Pipestone students had died. Dozens were taken to the school hospital, which quickly overflowed onto the screened-in porch, which was covered with canvas tarps to block out some of the cold. As soon as Eugene arrived on the porch, another boy stumbled toward him on his way to the outhouse, fell across Eugene’s bed, and died. Eugene was too sick to do anything, even to move. Those who survived the second day began to recover that evening… and they were ravenous. Eugene and a few of his Omaha-Winnebago chums crept barefoot to the kitchen through the bitter cold wearing nothing but long evening gowns. They hadn’t eaten for two days, so they stole several armloads of breakfast cakes and syrup and made a clean getaway. Whether or not the staff knew who was really behind the theft, JB blamed the “slop boys” who carted food around every morning. Some 200 kids had died at Carlisle, the first major Native American boarding school, but those deaths weren’t the result of the sort of sadistic punishment that went on later at Pipestone and some other schools during the first world war. Nor was gang warfare among students part of the Carlisle culture, as it was at Pipestone. So let’s consider how conditions might have degraded to the level of brutality that Eugene had to endure. Richard Henry Pratt established the Carlisle school in Pennsylvania in 1879, which became a model for many future schools like Pipestone in Minnesota. They were founded on a principle that Pratt stated in a speech in 1892: “A great general has said that the only good Indian is a dead one. In a sense, I agree with the sentiment, but only in this: that all the Indian there is in the race (character, culture, norms…) should be dead. Kill the Indian in him and save the man.” Pratt advocated “assimilation through total immersion,” and that quickly became the guiding principle among the American intelligentsia. On the other hand, I learned from Eugene Standingbear that while sacrifice and adversity can build character, trampling all that’s close to the heart makes the future dark unless the heart can somehow be restored. I think the old Indian Schools trampled many students’ hearts. And that’s probably one big reason why so many problems plagued students after graduation and their future generations. All that was close to their hearts had been trampled. Were the Native Americans really savage? Certainly they had their savage side… but so does everyone. To live on Earth is to be a noble savage. I suspect that the excessive savagery that came to define Native Americans wasn’t in the Native Americans themselves, but in white culture’s misperception of them… and that misperception might have been the result of projecting its own savagery on them, especially the massacre of entire Native American clans by the US cavalry and the catastrophic death and destruction of the Civil War, which reached a level of brutality that Native Americans could barely begin to fathom. There’s debate lately about whether or not humanity is becoming less savage with the advancements in civilization. Some statistics suggest that we are indeed becoming a more peaceful species. Others argue that we have the same level of savagery today as ever, just on a different scale. I lean toward the latter belief. I’ve long believed that two incompatible cultures (Euroamerican and Native American, in this case) can’t coexist in each other’s presence without suspicion and likely conflict. Indian schools were simply an effort to bring about compatibility quickly by replacing native values with Euroamerican values… assuming that the end (greater compatibility) would justify the means (strict, sometimes brutal Indian schools). How effective and how humane the process of indoctrination or assimilation is depends on the character and policies of those in charge, and there are countless noble-savage ways to do that… from bright, young companies attracting and hiring new employees… to ruthless governments brain-washing the masses. I suspect the process of indoctrination is a lot like parenting, and today there are four widely recognized styles of parenting (authoritarian, authoritative, permissive, and uninvolved), which show dramatic differences in the emotional stability and general well-being of the children as they grow up. The authoritarian model poses many problems for kids, and Indian schools like Pipestone were authoritarian in the extreme. Not so with Santee (below), which I suspect was more “authoritative” in nature… the best of the four parenting styles… judging from the noble character of its founder. 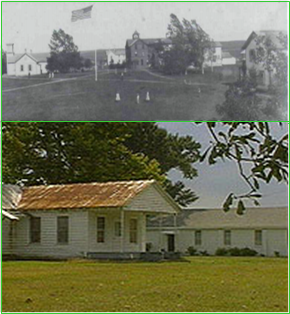 Santee Normal Training School, then and now. In 1920 Eugene was sent to bible school at Santee, Nebraska, on the banks of the Missouri River across from Springfield, South Dakota. The purpose of the Santee Normal Training School was to turn out Christian missionaries who would return to their Lakota reservations and spread the good word. Many Lakota youth were educated at Santee, but only a few chose the life of a Christian missionary. Even so, Christian values were firmly embedded in Native American culture through schools like Santee. Congregational missionaries Stephen Riggs (top) and his son Alfred, founder of Santee Normal Training School. The head of the school was Alfred L. Riggs (1837-1916), son of Reverend Stephen Riggs (1812-83). There’s probably no other Euroamericans who ever became more immersed in the Lakota people and more devoted to bridging the two diverse cultures than the Riggs family, who also included Stephen’s wife Mary, daughter Isabella, son Thomas, and grandsons Frederick and Theodore). They all spoke Lakota fluently. Stephen Riggs had spent a good part of his life writing alphabets for various Lakota dialects, or, more accurately, adjusting the English alphabet to fit Lakota vocal sounds, like gutterals. At the turn of the 20th Century he wrote the first bible in the Lakota language. His son Alfred taught Eugene and other Santee students how to put out three newspapers and a series of bibles, catechisms, and hymn books. Two of the newspapers were published in Lakota—the Ahmpah Oa (Morning Edition) and the Yahpi Owy (The Journal). The third newspaper, the Word Carrier, was printed in English and included Lakota explanations, since most students couldn’t speak, read, or write in English when they arrived at Santee. The religious publications were translated for various denominations, including Episcopalian, Presbyterian, and Catholic. They were also translated into the various Lakota dialects. The students composed type, ran flat-bed and job presses, and learned about written communication while they went about publishing. Besides printing, the school taught the basics—reading, writing, arithmetic, science, and history—as well as a few trades like blacksmithing. Sadly for Eugene and many of the other Lakota boys, the school had little in the way of a sports program. But that didn’t stop them. A group of Santee boys went to town every week during the fall and winter months to scrimmage against the American Legion football team. Santee was a reservation town, so the Legion team consisted exclusively of Lakota men. Eugene was quarterback for the young school team, and his buddy George “Tug” Wilson was fullback. The school players won a few scrimmages despite their age. They had devised a long list of signals and plays, but the best results happened with a simple hand-off to Tug, who would lunge and weave through the line with his head up to pick his way. He had great reflexes. On Thanksgiving Day, 1920, the Legion team in Santee, Nebraska, was scheduled to play against South Dakota’s all-star college team across the river in Springfield, but they were in a fix; both their quarterback and fullback were sick. A few days before the game, Eugene and Tug were invited to play for the Legionnaires, and they jumped at the opportunity. They were just 14, so they’d never played against college grid men. There was a heavy snow that morning when Eugene and Tug met the Legion team at the riverbank. Ordinarily a ferry boat carried passengers and cargo across the wide river, but now (as was often the case in late November) the waterline was below the ferry landing. The only alternative was a row boat, which had to make several runs before the entire team was carried across. Eugene and Tug had no opportunity to practice with the Legionnaires before the game, so they huddled on the snow-covered sand on the banks of the Missouri to work out a simple set of plays and signals. By the time they reached Springfield, the football field was blanketed by four inches of snow that had to be swept off all the yard lines and boundaries. Heavy flakes were still falling. To keep warm, most of the spectators had come supplied with bottles of brandy or whiskey. As soon as the starting gun sounded, the game became a comedy of errors. At the kick-off, several runners slipped and fell. The college boy who received the kick-off fumbled the ball several times before finally getting a handle on it. 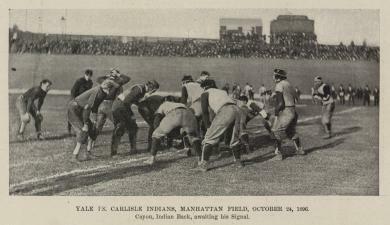 Everyone was chilled to the bone, and by halftime all of the players and even the officials were sneaking to the sidelines between plays to share three or four swallows of brandy with spectators—local townspeople, ranchers, farmers, and college kids, who overwhelmingly favored the college team over the Lakota team from Nebraska. The odds were against the Lakota men from the beginning, and things got worse by halftime. The college players had caught on to the simple signals of the Legionnaires, and the defense would start moving to the strategic spot in the line as soon as Eugene called his signals for a play. So Eugene had an idea. Instead of calling signals, he started shouting detailed instructions in Lakota to his Lakota teammates. Everyone was confused except the Legionnaires, who were suddenly making great strides, and the college team and spectators started to protest. The head official wasn’t sure what to do, so he ignored the protests. Then spectators began to throw snowballs at the Lakota team, which got everyone excited. Before long, dozens of half-drunken fans huddling along the sidelines began to swarm onto the field after every play and to pile on the football players of both teams. One fight erupted near the Legion bench, another broke out on the field, and the game was called off during the third quarter with no scores on the board. This entry was posted in Uncategorized and tagged brutal indian schools. Bookmark the permalink.